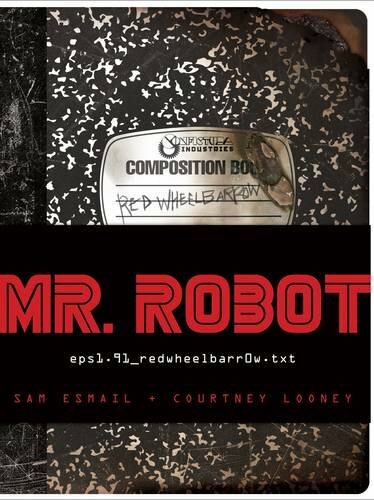 Anyway, I am doing a deep dive into the book Red Wheelbarrow by Sam Esmail and Courtney Looney, which was released last week. Today I am covering May 15th and 16th. One small update, the Reddit folks warned me about posting too many links in the Mr. Robot subreddit. In fairness, they were right, since the end of the season I was participating less and posting more links. I am going to reduce the links on Reddit, but please remember to come back or subscribe to the RSS feed or the newsletter (been posting two Red Wheelbarrows a week). Normally, I write a recap of Mr. Robot called “Who Is Mr. Robot's Landlord.” I also recap Black Mirror, Game of Thrones, Halt and Catch Fire, The Flash, Better Call Saul, and put out new playlists every Tuesday (among other music content). If you are not familiar with my writing on Mr. Robot, check out The complete #OPS Guide to Season 2 of #MrRobot. Missed Part One? Catch Up Now. Missed Part Two? Catch Up Now. Your New Update On "Mr. Robot"
Elliot (Rami Malek) signed off on May 14th by saying "Major Tom, signing off" which is a really dark joke if you think about it. Elliot has chosen to put himself in jail to avoid the authorities (ironic) and to exorcise Mr. Robot (Christian Slater) and I can attest to how bleak jail is but Major Tom is abandoned while floating in space as he is running out of oxygen. Major Tom laid his heart open to the benign indifference of the universe in the song, perhaps that is what Elliot is also trying to do in regards to Mr. Robot (any Camus fans)? Anyway, not only is Mr. Robot refusing to be excised by jail, he is in, as Elliot puts it "full attack mode" including annoying Elliot by singing R.E.M. 's "It's the End of the World" repetitively at him whenever possible. "It all starts with him. I still can't believe it, though I totally believe it. It all makes perfect sense...What doesn't make sense is if I caused this - all of it - why can't I get rid of him. And how does he have such a strong hold on me." Everyone wants to be the hero of their own story, everyone wants to disassociate from the evil things that they do, and nobody wants to take responsibility for the things that they have done that they are ashamed of doing. Dissociative Identity Disorder just allows Elliot to distance himself more effectively by fragmenting responsibility. I got the most backlash last season from people who don't want to see Elliot as a "bad guy" and I understand that, but he is a complicated character. I think it is better not to view him through a binary lens (seeing all things as either good or bad). So, anyway, Elliot goes to see a basketball game with his new "not a friend" Leon (Joey Bada$$) who is now following him around all the time. While watching what is probably his first basketball game, Elliot decides that if letting himself be sent to jail won't kill Mr. Robot, maybe boring him to death will. He sees people following predictable patterns in basketball and decides to make his entire life into a redundant routine (like a very simple looping program I suspect). "This is the ideal place for a psychopath like him...He could actually want to be here." "Does it have something to do with HIM? Something he's got on the brain that I'm catching on to?" "Oh, I haven't drawn you anything outside of the townhouse that I've created in my mind <see the last issue>." Then he draws a picture of the basketball court as it really is. Doubly bizarre for me, by the way, because I coached basketball in prison and had to draw diagrams of plays etc. Art imitating my life. Yikes! My larger takeaway from this is that there has always been a reason that Elliot's Alter, the Alter that both protects him and does the "bad stuff" for him, has the face of his dead Father. The truth of this was hinted at in the "Word Up Wednesday" episode from Season 2. Not only is Elliot conflicted about his own relationship with the Father that pushed him out of his own window, but he is also angry with how Edward treated women and allowed his wife to abuse Darlene (Carly Chaikin). My suspicion is still that Elliot is remembering something that was special between himself and his Father (the Red Wheelbarrow poem) but this is being translated through his complicated relationship with his memories of Edward. Funny the video for the R.E.M. song starts with an Election 2016 ad (a bit "on the nose" the day before the election if you ask me). Also, there was always a rumor that the song was written about "competitive debate" (which was my former job/life). Anyway, Elliot's official introduction to Carla (Eve Lindley) is when Carla almost hits him, instead of the person she is aiming at in the head with a tray (during a meal). Elliot realizes how even when he is minding his own business, jail can still be dangerous. Mr. Robot chimes in and reminds him, again, how stupid he was for putting "them" in prison and how careful he needs to be. Elliot thinks Carla is mad because she is trans and because the person she hit in the face with the tray and all of his friends were abusive to her, but Carla writes in the margin that she was mad that he stole her nail polish (six on one hand?). The second time Elliot runs into Carla she is hiding and crying. Elliot, in his Robin Hood mode, asks if she wants to help. Carla thinks about it for a few minutes then hits him. Apparently, Elliot could help her best by being a willing punching bag. By the way, yes, I think Elliot does literally talk to Tyrell Wellick (Martin Wallstrom) on the phone in jail and that Tyrell is 100% alive (check out my recap's for more details). So Elliot sees an episode of Nightline that covers Tyrell. He thinks about if Tyrell can keep himself hidden despite being public enemy number one. Elliot suggests that while Tyrell is in a situation similar to the one Osama Bin Laden was in he concludes that Tyrell might have the advantage because nobody knows where Tyrell is. "Studies show that if that many people know a secret, it'll get out faster." Exactly, people are really bad at keeping secrets. We learn that Leon is following Elliot around (obviously, we know that Leon is protecting Elliot). We learn that Elliot doesn't want to be friends but that Leon is starting to grow on him. As much as Elliot protests, it seems clear that he is starting to like Leon. One of the coolest parts of the Red Wheelbarrow book is that it has a number of inserts that are also Easter Eggs. The first insert referenced in the book is a letter Elliot receives with no obvious identifying information on the outside of the envelope and only a blank sheet of paper inside the envelope. While we don't get the piece of paper, we do get the envelope. Hot Carla writes on the outside of it because he likes to use it as a bookmark. Look, as much as I like to act like I know everything, I can't figure the puzzle of this one out. I am a theorist, I am not a hacker. The inside of the envelope has "Bank of E Savings and Loan" all over it. EP10 DUAL (05-08) - oddly enough, when I Google searched this it turned up an episode of the show Dual Survival (a show I used to watch). 583 -- 1SBB -- 10011 That last number is a New York Zip Code. I am sure I am missing someone, if anyone has any thoughts, please share them! One of my favorite thoughts about Season 2 was the idea that we were actually being encouraged to participate in creating a larger Mr. Robot universe. I want to make it clear that I don't think that I am an authority or that because I say some lots of stuff about Mr. Robot that it means that my ideas are right and other people's ideas are wrong. I also don't think I have any unique insight into Sam Esmail's mind and more importantly, I think it is wrong to think of an author or writer as authoritative. I believe that art is always co-productive (different to every person that watches it because of what they bring to the interpretation of the art they watch). I see what I do as a companion piece to the actual show. In other words, I try to offer a different way to look at the events of the show. When I argue, it is for the fun of sharing ideas with other people, not to prove that I am right (or wrong). "The Contemplation Moves Me Deeply"
This book is a hard read (not just because I am middle aged and the handwritten text is cramped and small). But, I am still having a great time with this. An eBook of answers to as many Season 2 questions as I have come up with. It should be out in the next month for sure (I am about halfway done). I am doing a few Teespring campaigns for some Mr. Robot and "Who Is Mr. Robot's Landlord?" themed T-Shirts. If you are into all the little details of the show, you will like the shirts. More information on that very soon. And, of course, many more Red Wheelbarrow pieces. Hope you are having as much fun as I am! You can subscribe using email below or through feedburner here. What do you think the "Blank Letter" was about? What is your favorite detail of Red Wheelbarrow so far?